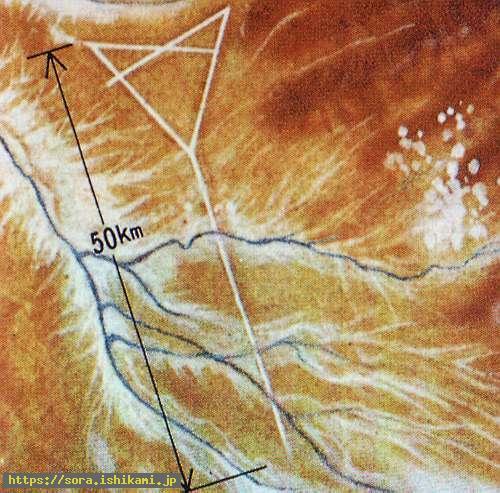 This is Nazca Line which was found from the photo taken by an artificial satellite. The width is 200m and the length is as long as 50km. As the whole figure is so big that it is certain it was not made by human hands. It goes across the several mountains and crosses the three valleys. According to the beings from the stars this pattern expresses the human ways to proceed. Humans recognized subconsciousness（=spirit）for a while but the Ruler's Stars taught humans not to recognize subconsciousness（=spirit）in the middle of the human history. Therefore humans were divided into two groups. One believe what was taught by the Ruler's Stars and the other believe the Trinity（body, subconsciousness and spirit=the power to live）. The line is divided to the left and right in the middle. The people who go the left way make a U-turn in a certain point and return to the same way as the old one. That is the way which was ruled by religions. Those people who are ruled by religions return the same way as the way of bygone days. We can know it as religious events are reviving a lot in these days. On the contrary, those who go the right way make a U-turn without returning to the bygone days as they know the meaning why the earth was made. They proceed while talking with the earth and giving thanks the blessing of the earth. Therefore they get to be released by any pains in the end which is expressed by the projection of the line(in the left). That is they can live without any anxiety as they understand the meanings of any kind of affairs which are taking place in reality.